Card Text Play: Deal 3 to a flank creature. Deal 2 to its neighbor. Deal 1 to the second creature’s other neighbor. If my opponent has less than 3 creatures, how does Positron Bolt work? You always resolve as much of an ability as possible. First, you deal 3 damage to a flank creature. Then, if there is a neighbor, you deal 2 damage to it. If my opponent has no creatures, can I still play Positron Bolt to get the Æmber bonus? Yes. The first step in playing any card is to receive the Æmber bonus, if any. Therefore, you can always play action cards to get the Æmber bonus, but are still obligated to resolve as much of the action card as possible. Since Positron Bolt can target any creature, you would have to resolve the “Play:” ability on your own creature(s), if you have any creatures in play. If the “Play:” ability of the action card is not resolvable, you still keep the Æmber bonus. 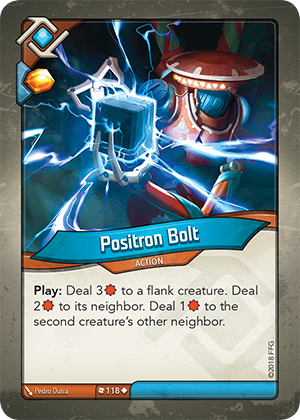 Does Positron Bolt deal its damage simultaneously to all creatures affected? Yes. If multiple creatures are damaged by a single effect, that damage is dealt simultaneously. Therefore, all damage dealt from Positron Bolt is dealt simultaneously.